Results? Just a 7.0/10. And it’s mostly my fault. 1. 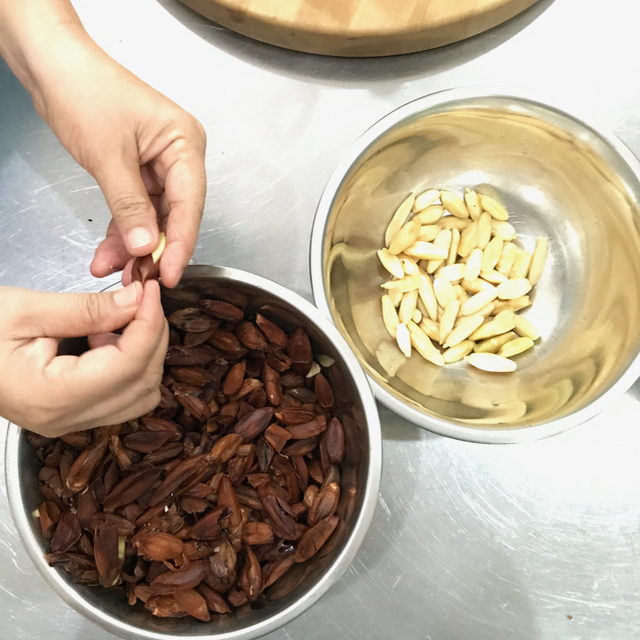 The pili nuts were rather small, and higher fat content than most nuts, so they cooked faster than pecans — read : they were a bit overcooked 2. 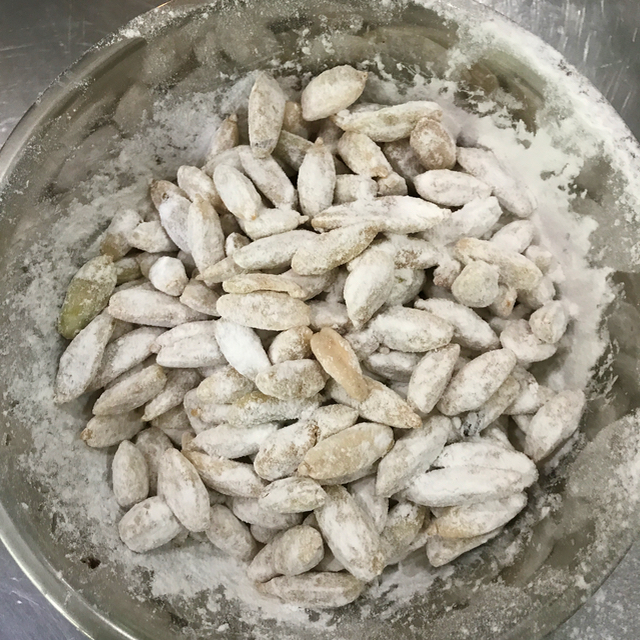 The sugar took roughly 4 minutes to reach the right color, and I pulled the nuts out then, but the intense humidity in Manila yesterday means they got hard, but not glassy hard and impervious to near 80% humidity levels — read : they started to get sticky after an hour or so. This could also mean I didn’t cook them long enough or there was too much moisture in the sugar/nuts before frying. Overall? 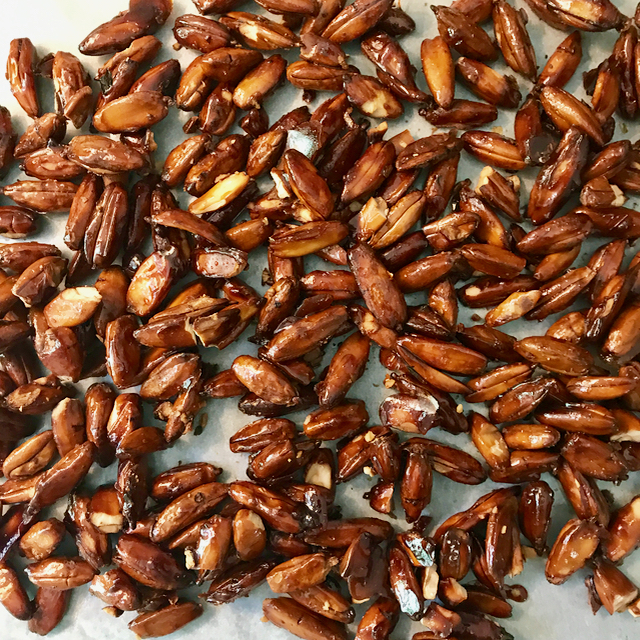 I wouldn’t do this again with pili nuts, but I will definitely do this with pecans as the video shows… And I will wait for a relatively low humidity day to cook them. Thanks F, for the link! Will the result be different if you use white or brown sugar? Where did you buy the pili nuts? I’ve been looking around in the supermarkets in Makati for unglazed pili nuts without success. Thanks. Works equally well with walnuts too which has a better omega-3 and omega-6 ratio besides being a lot cheaper than pecans. But don’t try this with blanched peanuts either. 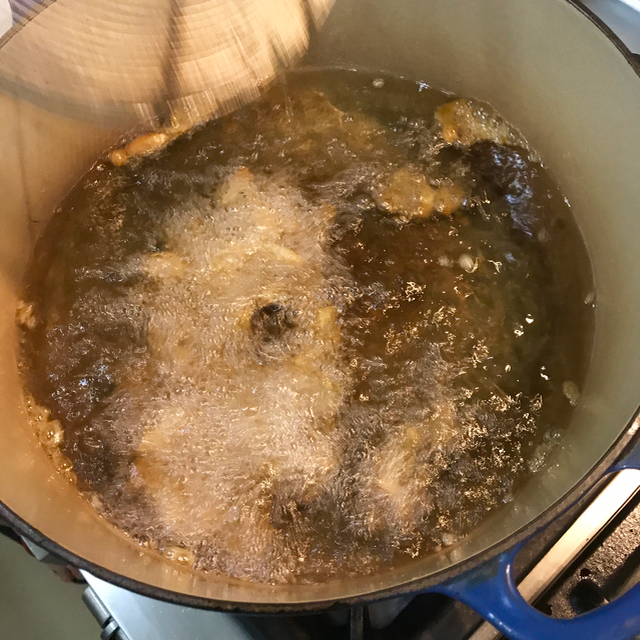 Blanched peanuts takes exactly 2 minutes to fry at 350°. It will be charred by the time the sugar coating starts caramelizing. 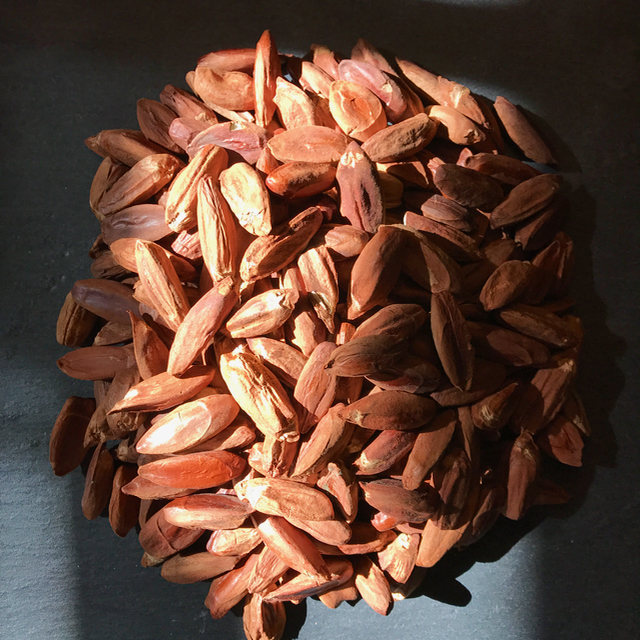 Use the caramelized sugar described here instead https://goo.gl/JmXBmM. 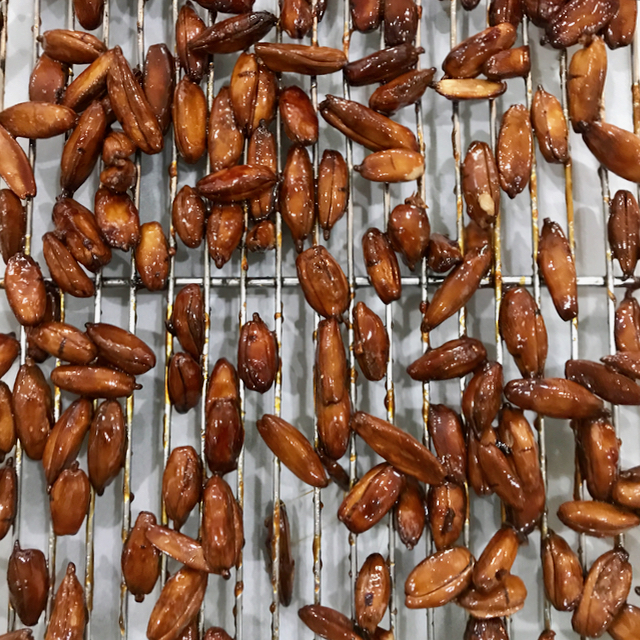 Moisten the blanched peanuts, coat with powdered caramelized sugar, spread on a baking sheet, stick in a slightly hotter oven and watch over till the caramel coating melts. Actually, if you don’t mind clumps/shards instead of individual nuts, you could make it into a brittle. Gently heat sugar in a non-stick pan till lightly caramelised…sort of golden…( added liquid glucose may help the process although I’ve never bothered) and dump in the nuts. Turn off the heat and stir with an oiled/buttered spoon. Spread onto a lined (silicon paper or mat) tray and let cool. Break into pieces. Chopping the brittle into rough bits and adding it into whipped, vanilla-ed cream to accompany poached/canned fruit makes for a great and quick dessert idea. ZUBUchon is featured in Migrationology by Mark Wiens, he joined the world street food congress tour organized by S.F. Seetoh, he loves your lechon. MM, try drying (baking at very low temperature with oven door slightly ajar) the nuts first to remove moisture. Here’s a great peanut brittle procedure https://goo.gl/rdYj8I It’s in French but you can wing it from the step by step pictures. He uses a bit of glucose to avoid crystallization and adds a bit of bicarbonate of soda at the end to get to foam up the candy and render it even brittler than usual. Yummy snack. What kind of cooking oil will you prefer? Yumm! nibble. What sort of cooking oil will you incline toward? Albert, vegetable oil works well.